The problem with most music biopics is that they try to condense the lives of complex, often troubled people into easily digestible narratives. Some great films have been made using that approach, but for the most part they result in some of the most formulaic stories imaginable. In telling the story of James Brown, Get on Up runs as far and fast away from that style as it can. Much like Olivier Dahan's La Vie en Rose, director Tate Taylor cuts between all the different eras of Brown's life and career, seemingly at random, and tries to capture as many different facets of his persona as it possibly can. And, much like Dahan's film, Taylor's relies on a singular, galvanizing central performance to keep the whole thing from completely falling apart. That last point is very important, because Get on Up is, for the most part, a mess. It opens with a scene of Brown (Chadwick Boseman) walking down a dimly-lit corridor to perform a show sometime in the late '80s, then jumps around to show his impoverished childhood, his first meeting with Bobby Byrd (Nelsan Ellis) and early work with The Famous Flames, through to his '60s and '70s heyday and his 1988 arrest following a high speed chase. Those events do not necessarily occur in that order. Taylor's jumbled approach to the narrative yields some powerful results. The young Brown's participation in a (presumably illegal) boxing match against other African American children to entertain a group of rich white people is immediately followed by a scene of him talking to journalists around the release of "Papa's Got a Brand New Bag." The irony of that combination - not to mention the underlying continuation, in that he's still having to perform by answering asinine questions from a white reporter - is palpable, and the film is littered with lots of similarly provocative combinations. For the most part, though, its main purpose is to stop the film from getting slowed down by focusing on one part of Brown's life when it could be following another. Being able to jump instantaneously from Brown talking with his mother to a scene of him and his band flying in to perform for black troops in Vietnam is jarring, but it's also intoxicating. It has the rambling quality of someone telling a story and having to backtrack every few minutes when they recall a detail they left out. Telling Brown's story out of sequence makes for a much more interesting experience than a strictly chronological one. 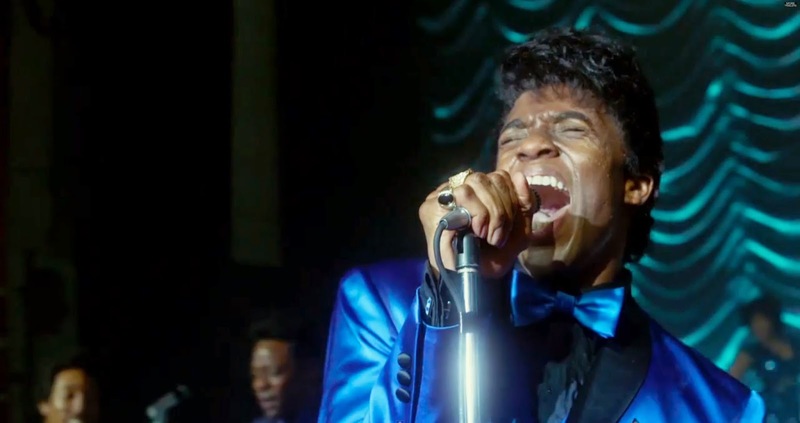 Taylor and his screenwriters, Jez Butterworth and John-Henry Butterworth, seem to have accepted that it would be impossible to encapsulate James Brown (not merely the man, but the musical and cultural force) through a straightforward narrative. Instead, the film puts (almost) every aspect of Brown's life on screen simultaneously, and leaves the audience to figure out what kind of person he was. It's an effective approach since it presents many different details of his life onstage and off without seeming to subscribe to any one meaning. The only thing it provides in addition to information is a furious energy that doesn't really go anywhere, and becomes tiring after two plus hours, but certainly makes some of the more predictable biopic scenes go by at an exhilarating pace. The one failing of the film in its panoramic approach is that it largely avoids references to Brown's drug problems and domestic abuse. Even when it does address them, it's very fleeting: it goes so far in avoided the topic of Brown's violence that the one instance in which he hits his second wife DeeDee (Jill Scott) only happens off-screen. It's the one concession the film makes to the typical biopic approach of making the worst aspects of an artist seem like one-off aberrations, rather than things that plagued them for years. The film seems to be saying that it wants to present a complex picture of Brown, but not too complex, which is a lapse in courage on the part of the filmmakers. The storytelling is further complicated by the way that Taylor plays with form in ways that are inconsistently applied. Sometimes Boseman will directly address the camera with a quick glance, and at others he walks out of scenes halfway through to talk to the audience in order to expound on a particular point. Most of the time, there's no acknowledgement that the film is a film, and it proceeds as if one of the characters isn't prone to breaking the fourth wall. There's little to no sense of a consistent vision lying behind the camera, or that the film is being deliberately inventive in the manner of something like American Splendor. It mainly feels like no one really knows quite what to make of James Brown or how to tell his story. Fortunately, there is consistency in front of the camera in the form of Chadwick Boseman. Whether he's replicating Brown's moves onstage or perfectly capturing his distinctive speech patterns, Boseman provides the solid core that allows Get on Up to get away with its inconsistencies and weird digressions. He brings charisma and electrifying energy to the role that never flags, and he manages to embody ever stage of the man's life without losing sight of the character. He's just as convincing playing Brown at 17 and 55, and he finds the emotional truth beneath the makeup and the extravagant clothing. Yet he also maintains an air of mystery that suggests that, for all the effort the film expends in trying to capture Brown's psychology, we can never truly know him. We can get an impression of him, though, and that is ultimately what the film does best. It provides a sense of James Brown without daring to be definitive about him. It's content to let the music speak for itself, and fill in the gaps between songs with sketches of a complex, fascinating man. The end result is inconsistent and messy, but it's also hugely enjoyable. All in all, that sounds like a fairly fitting tribute to its subject.